I can’t say “happy trees” with out thinking of Bob Ross. I loved watching his show when I was little. I couldn’t wait for Saturdays so I could watch his show on PBS. Yeah, I was a weird kid who preferred Bob Ross over cartoons! Welcome to my first time visitors! I’m glad to have ya here, and a big “Welcome Back” to my regular readers (you know I love ya!) Make sure you take a look around there’s lots of fun stuff going on. If you are new to quilting make sure you check out my “31 days” series that I’m doing this month on quilting with your walking foot. I wanted to try something fun and whimsical for my block. I made a little sketch on paper then designed my applique template using Adobe Illustrator. I could have used my EQ6, but some things are just quicker in a program that I have been using for over 10 years. I decided to use fun prints for the trees but wanted to do something special for the main tree. I’ve never tried crazy piecing but decided to try it out for the this project. I pulled lots of green scraps out of the scrap bin and just started piecing. I continued until I had a pieced fabric that was slightly larger than the oval needed for the main tree. Then I treated it like a regular piece of fabric and applied fusible web to the back and applied it to my block. Then I picked out fun Fall-ish looking fabrics for the other trees. I’ll be turning my little block into a small pillow for an armchair in my living room. The spider right in the center of the green tree was a complete fluke but I love that it looks like it was meant to be there hanging off the tree branch. The trees are stunning, specially the center one. Thank you so much for sharing and would love to win the pattern. I am your new follower! This is fabulous - the spider looks great in the centre there doesnt he and I love the colours you have used. Thanks for sharing. I would never have guessed from your sneak peek yesterday what was to come! I love it. Hi Norma I am a new follower and love your crazy patch tree in the center would love to have a copy of it...great job. What a great design, I love the centre paper pieced tree with the spider peeking out. Very cute design and love the 'swinging' spider!! Thank you for sharing. A great design with all this trees. The tree in the middle is sew awsome with the hanging spider. A brilliant idea to make a tree with pieces scraps. I love your trees - especially the centre one! Just started piecing! It looks amazing.I love the trees. Your spider in the tree is wonderful! The whole block is great!! Stunning, I love your block, the spider is great, the variaty of colors is super, just a lane of different trees with their own coloring. Thanks for sharing! Wow! How pretty! I love this! I love your happy trees. Bob Ross would be proud. I loved to watch him paint too. Good Morning Norma..... I fall for your trees..yes I do ..
Oh my gosh, the happy trees! My mom used to watch him when I was a little girl. I remember there was something about the way that he said shrubbery that made us giggle. Thanks for the happy memories! I love your trees - this is a really nice block. How adorable! I see a Happy Trees series coming soon to the quilting world!! So cute! What a lovely block. Very sweet and I love that it's an original too. Your block is stunning! How creative you are...thanks for sharing! I love your little blocks. Perfect for the season.I would so love to win. This one leafs me very happy! I love the trees! Thanks for sharing. So adorable...would love a copy. Enjoy your blog very much! Thanks! Love the trees. thanks for sharing! Your block is just plain beautiful. To me, the style is reminescent of the 1960`s. Light, bright and fun! Thank you so much for sharng your talents. Oh gosh I completely LOVE this design. Those trees are just fantastic. It definately needs to be a pattern for sure! Great block, the colors are great and the spider looks like he lived there for a long time. Thanks for being part of the hop. 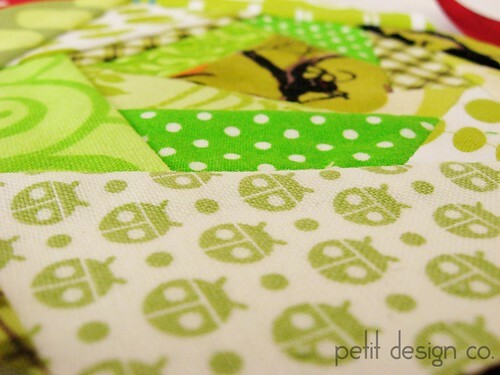 I never thought of treating a piece of patchwork with fusible web. Looks great! Oh wow! How adorable is this! What a clever idea to illustrate the changing fall leaves! I'd love to win the pattern. Thanks! That's such a cute design for fall, I'd love to win the pattern and play around with designs. Your spider looks like it was meant to be right there! I love your stunning trees and the spider is great in the centre of the design. i would love to win this pattern. Great job on the tree design, love, love, love the spider. I really like the trees. So many opportunities to make a custom color palette. Thanks for the chance to win the pattern! Love them. Striking!!! Your trees are great! I especially love the middle tree with all the greens and the spider!! Thanks for the chance to win the pattern and thanks for sharing your block!! I am nutty crazy about your trees. That spider... ick. They are hanging from the trees here, so creepy. ... but yours is cute, I think. I love this pattern, oh man I would love to be one of the winners, soo cool. what great trees. doadd them to eq! Your trees are beautiful in their simplicity! I love the fabrics you chose, too! It really says "Fall" to me! What a great idea!!! It looks terrific too. I love this pattern, what a fun blog hop!! I sm in awww of your Happy Trees!! L O V E!!! I just love the shapes of the trees, along with the unknow spider. They are colorful and cute. great block and congrats on being featured on Mdm Samm's blog. Well, your trees make me happy! The design and fabric are so fun. There are so many things to look at but it all blends well together. Great job! You are the star of the show!! I love your applique trees! I love applique, so I really like this. Great trees! Thanks for participating in the blog hop! The trees are great. I love to applique. Nancy P.
I would love o have a copy of the instructions for your beautiful block. Congratulations for being the top block of the day on the hop. Oh My! This is soooo sa-weet! Love the block. The trees are great. I would love to win a pettern for the trees. Thanks for the opportunity on the draw. Those trees are lovely. I like the paper pieced one in the middle. I am still learning paper pieced. These trees are fabulous. This will make a wonderful pillow. Norma-Love your little trees, so seasonal. Thanks for your explanation about the walking foot. I don't have one, but I'm always interested in learning more and that 's why I love following Blog Hops-they expand my knowledge of sewing. What a great pattern. Well done! Creative and fun! The spider was a happy accident. Love the red tree on the right :-) Thanks for sharing the pattern. Its is absolutely whimsy and I would love to have a pattern,. the spider is adorable, see what happens when we have fun ! Hi!!!! WOW!!!! I love it!!!! Your block is wonderful!!!! WONDERFUL!!!!! I love those trees and would be so happy to win the pattern. Thanks for the chance. Fantastic! I love your Happy Trees & would absolutely be estatic to receive a copy of the template! I used to watch Bob Ross too! Thanks do much for participating and inspiring me!! Hi You have a very nice tree and the colors are great, what more would you like for fall. I love your trees and the spider just happening is a sweet reward for a job well done. Thanks for the give-away. I would love to make these trees. What an outstanding block!!! Your spider WAS meant to be there in the center! I love all your trees, just a great block!!! As a Tree Hugger & Lover, I found your pattern design quite delightful!! 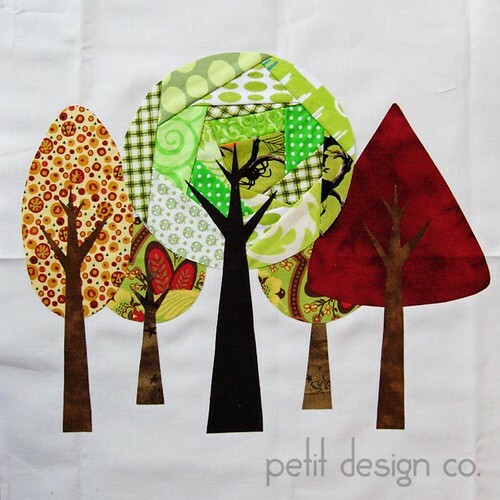 I love to do hand applique using a simple blanket stitch and would love to add your pattern to my beloved forest. Thank you so much for the chance to win such a great pattern and be part of this little blog hop!! Really love your tree block. What a cute leafy block! Your pieced tree has such liveliness and the surrounding trees complement it perfectly. Well done! I love Bob Ross and his Happy Trees. Our PBS is rerunning him occasionally. Love your Happy trees. Supper cute! I would love to win! Happy trees and the hairdoo --- Love Bob Ross!! Adore your applique and what a thrill it would be to have a copy of your pattern ... thank you so much for the chance and yes, I may be a first time visitor, but I will be a long time follower :) Thank you!! I loveeeeee your trees..they are so cute..and I'm glad the spider found a home in one of them..Thanks for the chance to win one of your patterns, it would be fun. Wow. I love those trees!! Wonderful block. How Cute. I love it! What a gorgeous block! And you couldn't have made that said look more perfect if you had tried. Love how your trees turned out, especially with the spider - couldn't have worked better. I loooove your pattern! And I'm crazy for trees!! What a cute block. Perfect for fall or any season, you can customize the colors. Thanks for the chance to win. Love the colours of your happy trees. The crazy fabric is awesome. Makes me want to go rummaging in my scrap pile right now. Your trees look great! I love your choice of fabrics. Yes, I remember Bob Ross and the other guy too with the "mighty brush". LOL Boy does that bring back memories of Saturday afternoons. My first time visiting your blog. Really liked the walking foot post. My WF always makes me feel like I'm driving a car w/a bad alignment. Loved your pillow and very happy to have a chance to win a copy of the pattern. Thank you. I love your block!!! It is gorgeous!!! Love your trees! Whimsical, but very nice looking at the same time! Thanks for sharing. Love your block; tree images are a favorite and this block looks great. I like your trees very much. Well done. Gorgeous trees! I really like the red batik one. Thank you also for the chance to win your pattern. I love those trees! So quirky and fun! Well done!!!!! Your trees are fantastic. I love them! Thanks so much for sharing. Ooh! Great trees! I'd love to win the pattern - thank you for the chance to win! You have very smart spiders at your house, they know when to get into the picture of things Thanks for sharing you cute pillow cover and for the giveaway. I love your trees pillow cover. Would love to win the pattern - thanks for the give-a-way. Love the trees! Made me laugh thinking of Bob saying "happy little trees." Too funny! Wonderful block. Really like the pieced tree. Love trees and would love to be included. Yours are delightful! What neat trees! Love all the different fabrics in them. Hiya! What a fantastic applique. And I love Bob Ross too, our local PBS still airs his shows on Friday afternoons. That spider is so cute, and I don't even like spiders lol. Thanks for sharing and having the giveaway. Blessed be, hugs!!! It's amazing how the spider just happens to be hanging on the tree branch! Sometimes things just turn out better than planned. I love the block and it will be an adorable pillow. Thank you for partipating and sharing with us. I like paper piecing - it is fun. Thank you for sharing your pattern with 10 lucky winners. oh my how very cute thanks for sharing! Unos árboles muy diferentes a los habituales. Me gustan. I love your soon to be pillow! The tree's are awesome! I would love to win a copy of it! I love your trees! The fabric is perfect.